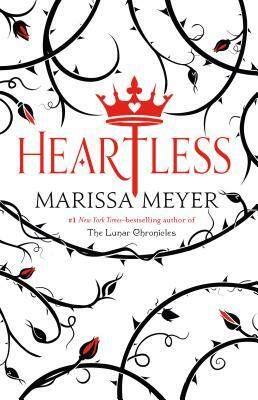 Heartless is the first stand-alone fantasy novel by American author, Marissa Meyer. Lady Catherine Pinkerton, daughter of the Marquess of Rock Turtle Cove, has one fervent desire: to open her own bakery in the Main Street of the Kingdom of Hearts. But her ambitious mother has other ideas. Determined that her daughter will draw the King’s attention, the Marchioness ensures that Cath is the only one dressed in red at the King’s Black and White Ball. And this is where Cath meets the man of her dreams (literally), but it’s not the King. Every good story needs a character to despise, but did you ever wonder how the Queen of Hearts in Lewis Carroll’s Alice’s Adventures In Wonderland got to be so imperious, so cranky, so very despicable? Marissa Meyer has given us her story. And what a tale it is! This prequel has all the essential Alice elements: the Cheshire Cat, the Mad Hatter, the White Rabbit, the March Hare, the King of Hearts, the Mock Turtle, the dreaded Jabberwock, as well as borrowing from other fiction and introducing brand new characters. Meyer gives the reader an ingenious plot with a few twists and an exciting climax. There is plenty of humour which takes the form of witty dialogue, a good dose of irony, a generous helping of puns and lots of other word play, including clever rhymes. There’s magic and an abundance of echoes of the original Alice. And there are moments that will cause a lump in the throat and maybe even a tear or two. This is a brilliant read and readers will wonder to what Meyer will turn her considerable talents next. Recommended.